When you don’t know what to make for lunch or dinner, what do you usually end up making? My go-to is the almighty quinoa salad! 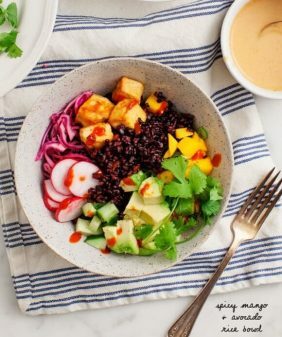 I usually have a batch of quinoa on hand in my fridge or freezer (note: quinoa freezes exceptionally well), which makes salads like this easy to put together at the last minute. Quinoa salads are a versatile way to show off the seasons, and this one is my little tribute to spring. 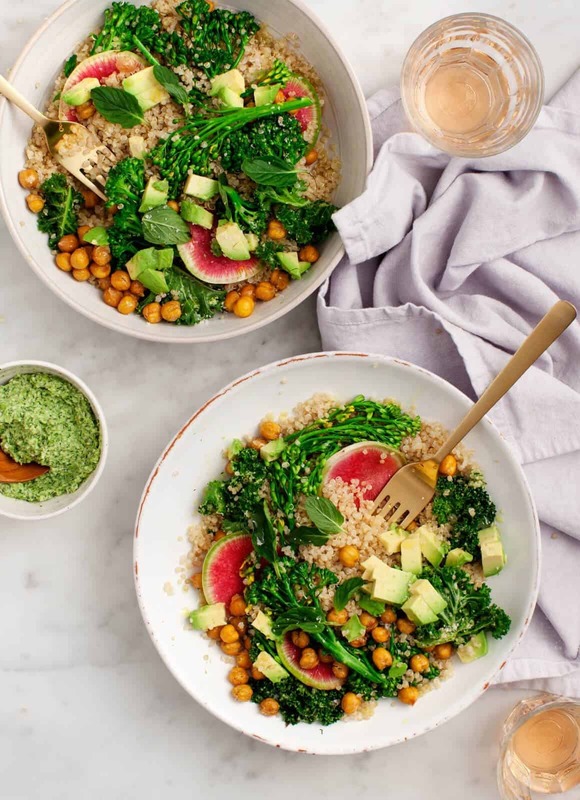 For this recipe, I lightly blanched some beautiful broccolini and tossed my quinoa with kale, fresh mint, roasted chickpeas, avocado, and my favorite part – crisp, pink slices of watermelon radish. Don’t worry, if you can’t find watermelon radishes, thinly sliced red radishes will provide the same crisp bite. And if you can’t find broccolini, regular broccoli will work just fine. I simply dress everything in lemon and olive oil and then finish the salad with big dollops of my favorite lemony pea pesto. 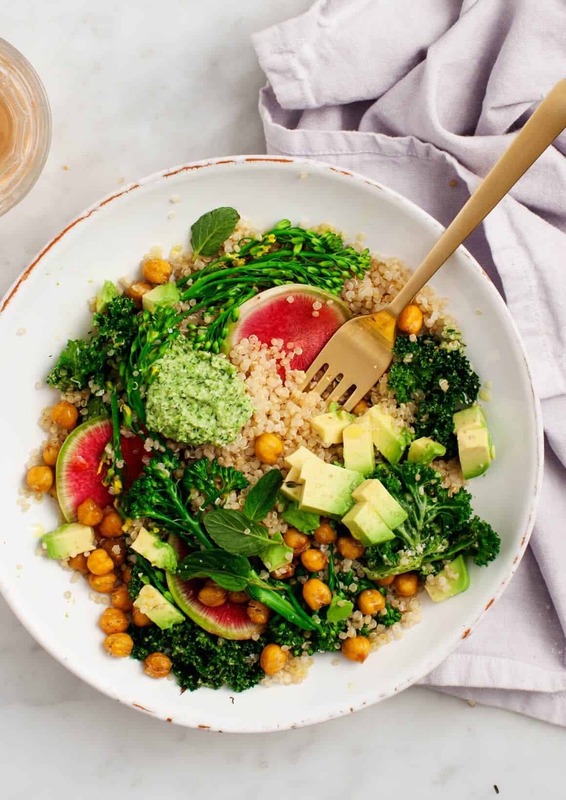 This kale quinoa salad recipe has the perfect balance of creamy, crunchy, fresh, and hearty elements, and to me, the bright colors and lemony, herby flavors make it the quintessential spring dish. Don’t slice the avocado until you’re ready to serve. Like bananas and apples, avocados oxidize, or turn brown, as they sit out. As they brown, they can become bitter – not what you want in your lunch! Save them for the last minute to get perfectly green, creamy bites. Store the pesto separately. Storing the pesto in a separate container allows you to season it to taste and adjust its consistency before serving. If it’s too thick, stir in more olive oil, or if it needs a boost of brightness, add a little more lemon. Taste and adjust. When you make a grain salad ahead of time, always taste it before serving. Because the grains absorb the dressing, I find that they often need extra lemon, a drizzle of olive oil, or more salt and pepper on day 2 or 3. Prep and store individual servings ahead of time (I like to use these glass containers), or toss everything together in a big bowl and bring this salad to a spring picnic or gathering! 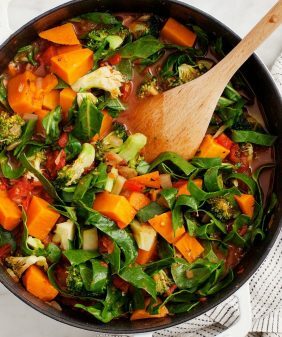 Feel free to play with the veggies and herbs in this recipe! 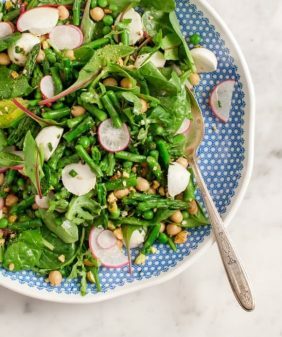 Blanched asparagus or snap peas would both be great additions, or you could also sub in arugula or spinach in place of the kale. For extra crunch, top it with your favorite nuts or seeds (pepitas would be a great choice), and if you’re not vegan, a little feta would be a fun finishing touch. For more healthy lunch ideas, check out this kale salad, this quinoa bowl, or this list of my go-to packed lunches! This quinoa salad is a great lunch or healthy dinner. Loaded with kale, roasted chickpeas, crunchy veggies, and a bright pea pesto, it's healthy, vegan & gluten-free. Prepare a large pot of salted boiling water and a large bowl of ice water. Drop the broccolini into the boiling water and blanch for about 1 minute, or until tender but still vibrant green. 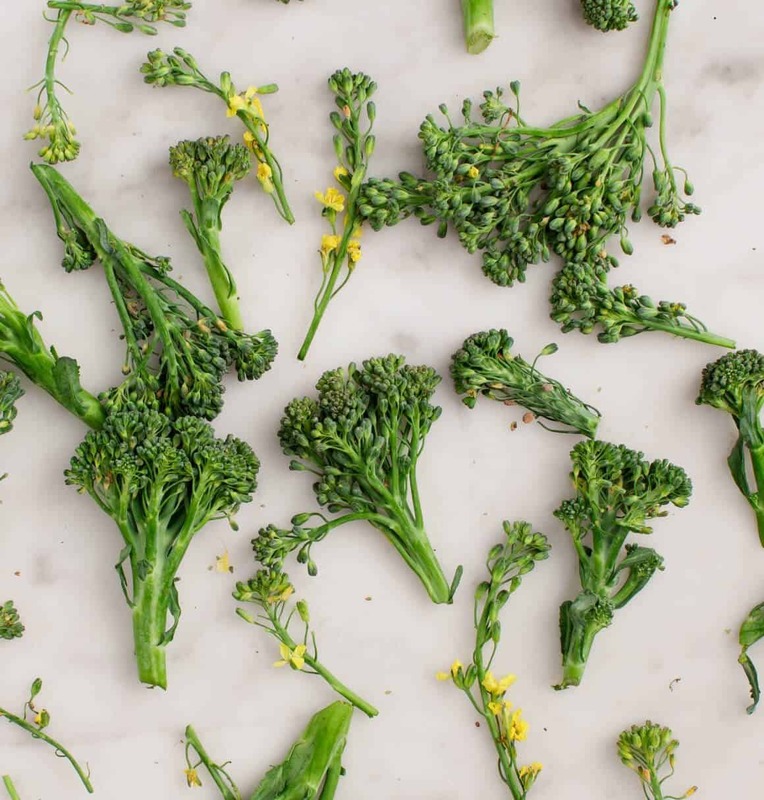 Transfer the broccolini to the ice water for 1 minute to stop the cooking process. Drain and set aside. Make the Lemony pea pesto: In a food processor, place the hemp seeds, peas, garlic, and salt and pulse until combined. Add the spinach, dill, lemon juice, and mustard and pulse again. While the processor is running, drizzle in the olive oil. For a thinner pesto, add more olive oil until it reaches your desired consistency. Taste and adjust seasonings. 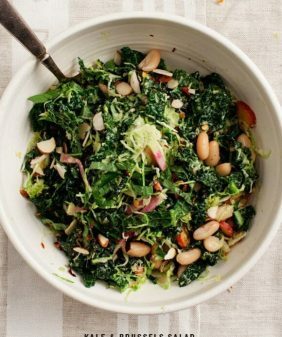 Place the kale into a large bowl and drizzle with olive oil, pinches of salt and pepper, and the lemon juice. Massage the leaves until they soften and wilt down. Portion into serving bowls with the quinoa, watermelon radish, avocado, herbs, and broccolini. Season to taste with additional olive oil, lemon juice, salt and pepper. Add the roasted chickpeas and serve with dollops of pea pesto. Just want to let you know how much I truly truly enjoy your recipes. Trying to convert to a vegetarian (due to cancer) but the process has been slow…LOL! I have tried a number of your recipes and they have so far won me and my 10 year old over. By the way ordered your cookbook as well! I recommend this sight to anyone and everyone looking for healthier eating! Keep up the great work! I am so inspired to make more of your bowls for my lunches. So healthy! Such a gorgeous dish – love pop of color from the watermelon radish! I love this recipe with the broccolini and avocado! Yesterday we made a quinoa salad with farmer’s market beets, cilantro, mint, parsley, snap peas, and a lemon-ume vinaigrette. Thanks for your inspiration. This bowl is full of super powers! With hemp seeds you get a good protein and omega-3 fatty acids. With kale and broccoli vitamin K and fiber. With avocado you eat good portion of healthy monounsaturated fatty acids and folate. Definitely recipe worth to try! Can’t find any watermelon radishes near me. What could I use instead? Hi Tayla, you can use regular radishes or skip them (or slice carrots really thin for a little crunch). They’re not necessary here if you can’t find them. 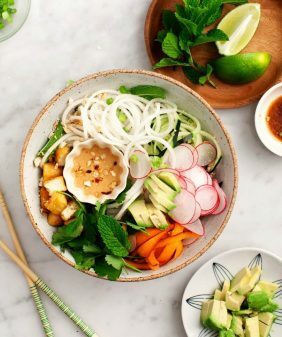 I really love this quinoa bowl, especially the mint in it. Now to hunt down some watermelon radishes. 😉 When I’m feeling uninspired for dinner I’ll usually roast off a mix of veggies, cross my fingers I still have some cooked beans in the freezer, and then go from there. All-in-one meals like this are a saving grace for me. This one looks so bright and happy for spring, and I adore the radishes! They are so under appreciated, aren’t they? Okay, terrible of me but kale and quinoa (so basically, the essentials in this particular recipe) are two ingredients I have never worked with. I eat them all the time but I never prepare it myself. I guess I’ll have to give it a go! How do you cook your quinoa? I know a lot of people cook it slightly differently so I’m intrigued as to how you do it. Recommendations for a protein other than chickpeas? Hi Siri, baked tofu, or just sprinkle on some hemp seeds. Hope that helps! I couldn’t find broccolini except in the frozen section. Would frozen broccolini be as good for this? To be honest, I don’t love frozen broccoli (it’s a little soggy), I would suggest regular fresh broccoli or even asparagus instead. Hope that helps! That is helpful to know. Thanks for the suggestions! Well, it’s finally starting to feel like spring where I live and it’s time to make some healthy and fresh choices. Recipe looks so good and the pea pesto is the bomb. Definitely trying this tomorrow for lunch. 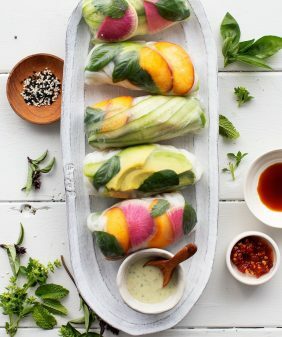 This is a lovely recipe, looks inspiring and utterly delicious. I love that it feels like something I can try out, especially for the healthy dose of omega-3 fatty acids and other powerful nutrients. Thanks for sharing this recipe with us, keep them coming! Hi Elisa, I hope you love the quinoa bowls! This sounds wonderful. What could I substitute for the hemp seeds? I made this for dinner tonight and it was fantastic. I used pepitas in place of the hemp seeds and it was great.